Olson Electronics has recently released its new website to enable purchasing of its products online for the very first time. The website is a significant improvement from its previous version and has been released in-line with its 55-years of British manufacturing celebration. 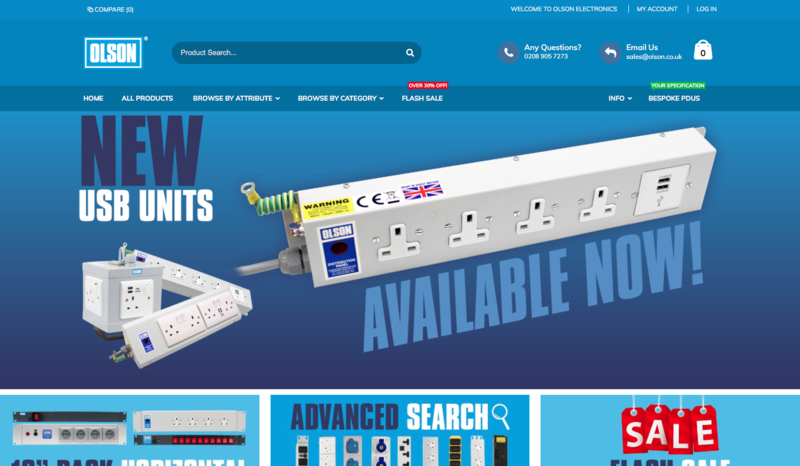 Whilst offering the largest PDU product range on the market, it can often be difficult to pin-point the one product a customer requires for a specific application and the new website overcomes this. Thankfully Olson has responded from customer feedback, making this task a lot quicker and easier. It caters for quick navigation to the socket, plug/inlet, orientation or switching requirement a customer is looking for within a power distribution unit, with further filtering to find the exact product thereafter. Customers can view individual ranges or just show every product listed and filter down from there. It also has an advanced search to lookup all of the attributes of a PDU needed and display the results immediately. Although it only showcases Olson’s standard products, its bespoke service is still very prominent within the site, offering an immediate messaging service to its own sales office. Product information and specification has never been so detailed. Every product has an abundance of information to answer the questions that need answering, to then easily assist in further assurance that a customer has found what they need.